Who doesn't love a good laser pointer? They're good for presentations, the classroom, annoying coworkers and driving your cat insane. 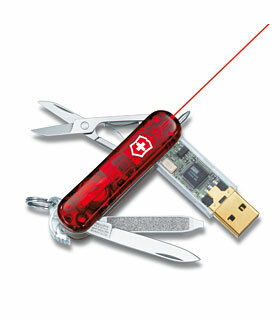 The new USB flash drive from Victorinox/Swiss Army features 2GB capacity, a blade, nail file/screwdriver, scissors, retractable ball point pen and, of course, a laser beam - visible up to 70' or 300' in "complete darkeness." Oh, and it will set you back $148. And I assume you can't bring it on airplanes or into any heavily-secured buildings. But hey, it has a laser.